Since the time of the conquistadors, the legend of an ancient, lost civilization deep in the Amazon forest has beguiled hundreds of explorers and led many to their deaths. Some called their dream El Dorado. Others, most notably Colonel Percy Fawcett, the gloriously mustached British explorer (and real-life model for Indiana Jones) named it the City of Z. But no one has ever returned from the Amazon with conclusive proof that such a place existed. Three scientists have now come close to doing just that. 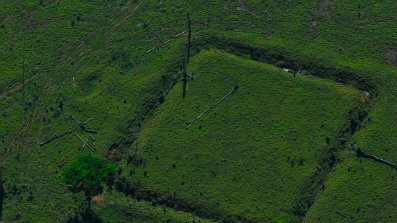 The journal Antiquity has published a report showing more than 200 massive earthworks in the upper Amazon basin near Brazil’s border with Bolivia. From the sky it looks as if a series of geometric figures has been carved into the earth, but the archeologists and historians who published the report believe these shapes are the remains of roads, bridges, moats, avenues and squares that formed the basis for a sophisticated civilization spanning 155 miles, which could have supported a population of 60,000. The remains date from AD200 to 1283. It is an astonishing find — one that builds on recent archeological work in Brazil and northern Bolivia and the availability of Google Earth images of deforested sections of the Amazon. Since the 1980s anthropologists have begun to uncover evidence of advanced civilisations who lived in the Amazon basin: this latest development trumps them all. David Grann, author of “The Lost City of Z,” believes the importance of this discovery cannot be understated. “It shatters the prevailing notions of what the Amazon looked like before the arrival of Christopher Columbus,” he says. This entry was posted on January 13, 2010 at 8:00am01 and is filed under Uncategorized. You can follow any responses to this entry through the RSS 2.0 feed. You can leave a response, or trackback from your own site. i need more info for a report!!!!!!!!!!!!!!!!!!!!!!!!!!!!!!!!!!!!!!!! Read Clark Erickson and William Denevan, they’ve conducted much of the original research on the sites in the Moxo plains of Bolivia (Northern Amazon). WOW, thank you for that info. can u send me as much info as you can on this i am studing history and this would be a good peice to work on i have always been interested on this subject thanks and how long do you thing before they find out if it really was a city of gold.